A free CARFAX Vehicle History report to assure that your Honda Certified Pre-Owned Car does not contain any DMV-reported incidents such as salvage, fire, flood damage, odometer problems or lemon history. Is a Certified Pre-Owned Honda Worth it? Yes, because every one comes with a 182-point inspection so you purchase with confidence. But we don’t stop there. The next step is reconditioning or replacing any unsatisfactory parts. Then, and only then, can it be called Certified. 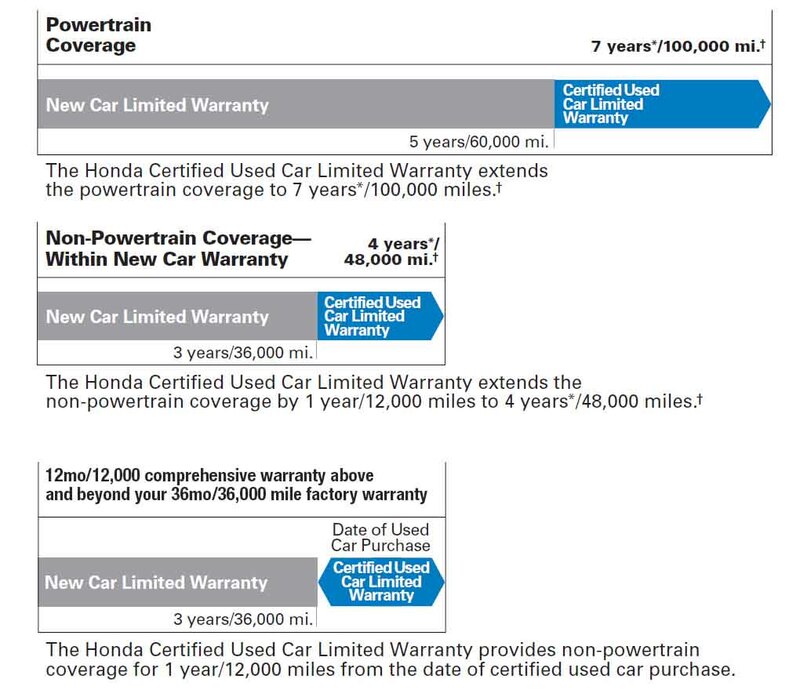 Does a Honda Certified Pre-Owned Vehicle come with a Warranty? What would you give for 7 years of peace of mind? How about nothing? Not only are Honda Certified Pre-Owned Cars reliable, they are also covered by one of the most extensive pre-owned-car limited warranties in the business. Deductible? Zip. Nada. Nothing. 12 month/12,000 mile comprehensive warranty above and beyond your 36 month/36,000 mile factory warranty. With a Non-Honda Certified Pre-Owned Vehicle you may get an extended Warranty, but read it carefully because it usually doesn’t entail much and is usually not very long. Typically a Non-Honda Certified Pre-Owned Vehicle does not need to be of a certain age, mileage, and doesn’t require a clean Carfax History Report. Bonus: Honda Certification increases the value of your vehicle. If you go to any of the three major evaluation guides and look under the details of a Certified, it is the true Honda Manufacturer Certification that is explained and that you get increased value for. So when you trade in your Honda it will absolutely have increased value. In summation: Honda Certified gives you a cleaner, more valuable, better Warranty coverage, clean Carfax Honda that has undergone an in depth 182 Point Inspection.